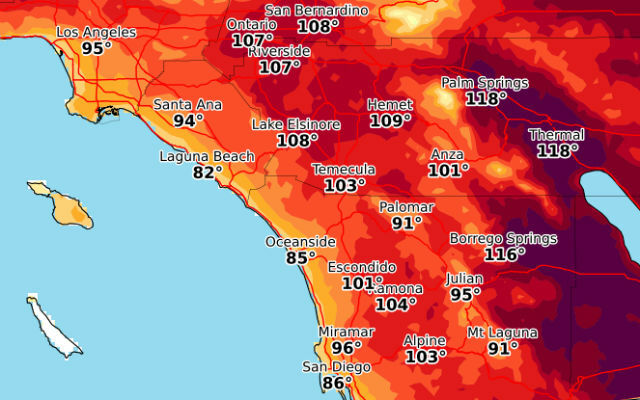 Another heat wave is forecast for the San Diego region, with high temperatures in the 95- to 105-degree range in East County by Monday. The weather service said the excessive heat would begin on Monday and last at least through Thursday, but could continue beyond. The inland valleys and mountains will bear the brunt of the heat. It won’t be quite as hot along the coast, with highs only in the mid 80s. The high surf, which is caused by a Southern Hemisphere swell, will be most pronounced at south-facing beaches north of Del Mar.